A luxurious beach vacation awaits at Villa Sila. You’re greeted by an immaculately landscaped outdoor compound, tastefully appointed living spaces and sweeping coastal views the moment you step in. The villa’s full range of amenities - from the fitness centre to sauna room and entertainment room - ensures that there’s something for every vacationer. Containing a total of seven bedrooms, Villa Sila is ideally kitted out for large families or shared among a group of 14. A maximum of 14 guests are accommodated in seven bedrooms. Each is generously proportioned and finely appointed, and comes complete with double beds or twin singles, quality linen, mini fridges, TVs and en suite bathrooms. A decorative feature wall, hanging lamps and indoor plants add on to the room’s ambience, while air conditioners and ceiling fans help ensure that the interiors are kept comfortably cool throughout the day. Villa Sila’s beautifully manicured lawn contains a sparkling pool (filled with mineralised water), lawn and patio area. The villa’s excellent seafront position offers spectacular ocean views - whether you’re taking a dip in the pool, sunbathing upon the loungers or dining al fresco under a decorative outdoor sala. A full range of outdoor equipment - like barbecue facilities, surround sound speakers and a bar fridge - help create the right ambience for poolside dinner parties. 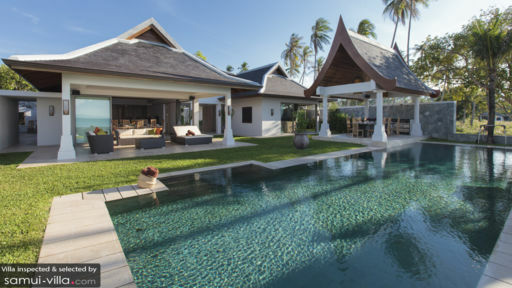 Villa Sila combines contemporary and traditional design elements in its architecture and interiors. Each pavilion boasts ornate Thai-style roofs, pillars, vaulted ceilings and large windows and doors that allow ample sunlight to cascade in. Most of your social activities will take place in the main living area, which contains a lounge, dining area and kitchen. 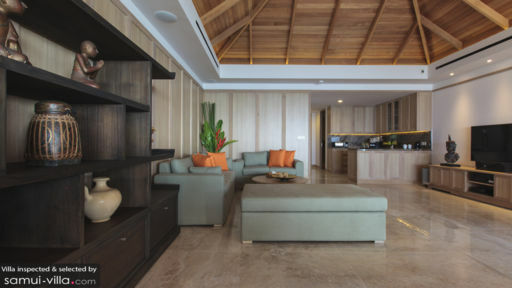 Pillowy sofas center around a flat screen TV, an elegant dining set seats 14 and the wood-dominated western kitchen allows access to a larger Thai-style kitchen, where your in-villa chefs work away at preparing delicious feasts. Additional amenities on the ground floor include a sauna room, entertainment room, fitness centre and two outdoor salas. Offering impeccable service, guests at Villa Sila won’t be left wanting for more. Housekeeping, butler, 24/7 security, nightly beach watchman and concierge services are included with your stay. Breakfast is served daily by your personal chef, while lunch and dinner will be prepared at no additional cost if you’re ordering from the in-villa dining menu. 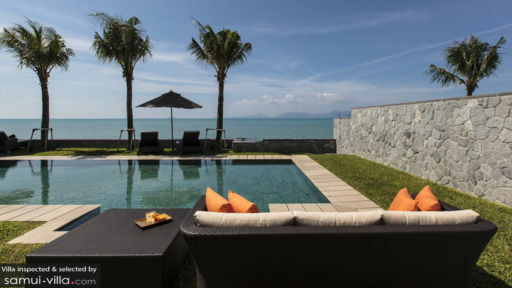 Villa Sila is located in the coastal town of Mae Nam, in north Samui. The town’s laid back ambience offers a refreshing change from the busy tourist hubs in the east, and will appeal to families and holidaymakers seeking a restful getaway. Mae Nam Beach, with its calm waters and relaxed vibes is a popular hangout for families. It’s located just a skip away from your villa. And 15 minutes’ walk from the beach is Mae Nam walking street. Set up every Thursday evening, the walking street draws locals and tourists alike, and is a great way for travellers to discover the local street food and shopping scene. Dining out is a breeze as restaurants and cafes are peppered all around the vicinity. Fisherman’s Village, a hub dotted with upscale dining and shopping establishments is about eight minutes’ drive away. Other venues that come with our recommendation include The Farmer Restaurant and Bar, Kobori Japanese Restaurant and Mathis Café. Vacationers of all ages will enjoy visiting the island’s renowned cultural attractions. The iconic Big Buddha is just nine minutes’ drive away, while sites like Khao Chedi and Laem Sor Pagoda are about an hour’s drive from your villa.